The first Office packages were installed with floppy disks, followed by CDs and later DVDs. In companies, the IT could adjust the MSI installation packages. Updates are available through Windows Update and companies made the updates available via WSUS. Again, there is the opportunity to make adjustments for companies. Otherwise, the installation will be streamed over the Internet. Let the internet speed once outside before, the C2R consumption method just as long. The advantage is that the user can work after a few minutes with Word, Excel or PowerPoint while the installation continues in the background. C2R is now in its second generation. how it looks now with the updates, so newer versions? These are automatically installed in the background. However, it should be noted that all other operating system updates continue to be the normal way (Windows Update) obtained and installed. And some C2R updates will not be installed if just the Windows updates have been installed. This dependence must not lose sight of you. So I have a Windows 8.1 64-bit system in the lab, in which I only installed via C2R OneDrive for Business. There, however, the latest version of Groove.exe (as of 26/09/2014 with version 15.0.4649.1003) was not available. Only after I installed an optional Windows Update, it still took a while, then the only Office program on this device, namely OneDrive for Business was raised to the latest version in the background. The special feature of lab test above is that no other Office program is installed. Are there any other Office programs installed by C2R, so you can influence on the update behavior. 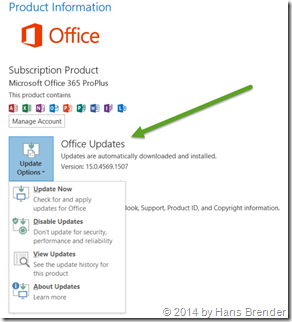 From Word, Excel … File – Account you reach the product information and there are also hidden the update options.